You need to call to make an appointment to apply for your visa, the number is +996 312 662 065. The woman who works there does speak English but it’s easier if a Russian speaker calls on your behalf- you will be told to come at 10am- maybe the next day, maybe in a few days! People who turn up to the embassy without an appointment are sent away and told to telephone. Don’t be late! The door to the embassy is surrounded by a fence where all the days applicants and collectors wait outside like reverse monkeys in a zoo. The security guards are equally as unfriendly and wave their stick at you to stand back off the pavement. At 10am the lady emerges from the door, stands on the top step and reads out a list of names. Listen carefully and make sure she acknowledges your presence- she speaks really quietly. Then she goes back inside and one by one you get ‘buzzed’ through the gate to enter. The queue system is officially the order by which she calls the names out so make a note who is before/after you. Submitting your application once inside the office actually only takes a few minutes, she checks your documents then tells you to telephone on a particular day and at a particular time (generally in about a week’s time). Don’t bother asking for ‘express’ or marking this on your application form- all visas take the same amount of time to process and you may be charged extra for express! You can try calling a day or so earlier if you’re feeling lucky! When you call, she gives you a day to come and collect the visa- sometimes the following day, sometimes in a few days but again at 10am (above rules apply for collecting visa regarding list, queue ‘system’ etc). She refuses to let you come any earlier, even if you ask nicely. Frustratingly, when you arrive to collect your visa she takes your documents from a pile where you know they have been sat for 10 days and not been touched. She double checks the dates you want, you pay $75 each and she sticks the visa in your passport. Check the dates are correct before you leave. You may get a smile but it’s unlikely, however cheerful or thankful you are. Our first attempt to cross the border was near Zhibek Zholy, there were crowds of people waiting but the big gates were closed. We drove approx. 100km SW to the next border crossing at Yalama/Chinooz which was much quieter. The gates were closed so we parked outside and went through a side gate. We showed our passports and car registration document, they entered our details into a big ledger, gave us a small piece of paper with our car details on, then opened the gates. The driver (Andy) drove through and parked outside the customs building, as a passenger I had to walk to the customs and passport control building. We had an initial problem with the car as when we entered Kazakhstan we were told on a 15 day visa we did not need a customs declaration form for the car. 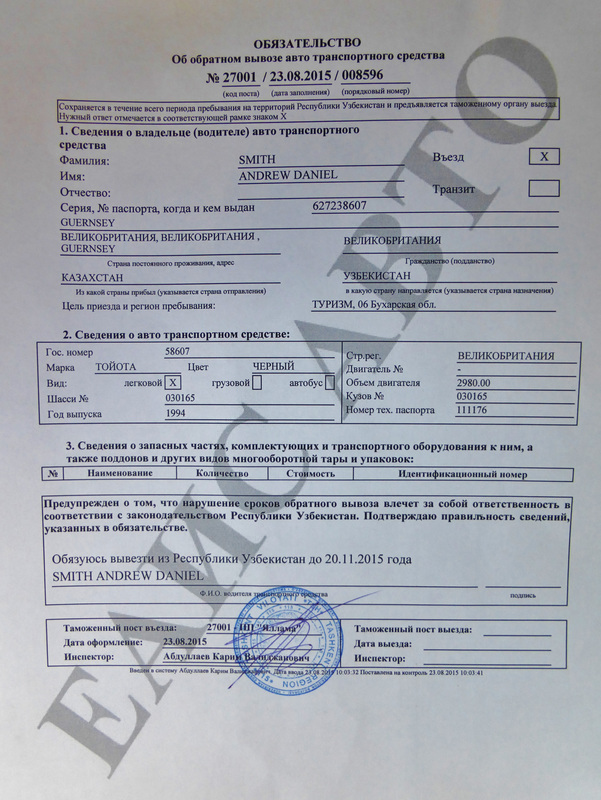 Fortunately they did not collect our Kyrgyz vehicle declaration when we exited Kyrgyzstan so we could show this, however this was obviously out of date which confused the issue further. We went to the passport control booths where they issued an exit stamp and collected our migration cards. Outside, we gave the small stamped piece of paper to a customs officer who also checked the car registration document and Andy’s passport- he didn’t search the car or contents at all, stamped the small piece of paper and we left the customs area. At the final exit barrier we showed our small, stamped paper which was collected. We drove between two stationary queues of traffic and through a water trough, stopping at a barrier. An officer in a small office on the right entered both our passport details into a ledger, plus the car details alongside Andy’s name. He gave us a small piece of paper with three sections on and stamped the first section. We drove further on and parked outside the customs and passport control building on the right. We went to a passport control window where our visa was stamped with an entry stamp. We went through to the next area where we had to fill out 2 ‘passenger customs declaration’ forms each. On this you have to declare how much cash you are bringing into the country- it is important that on your exit declaration this amount does not exceed this. 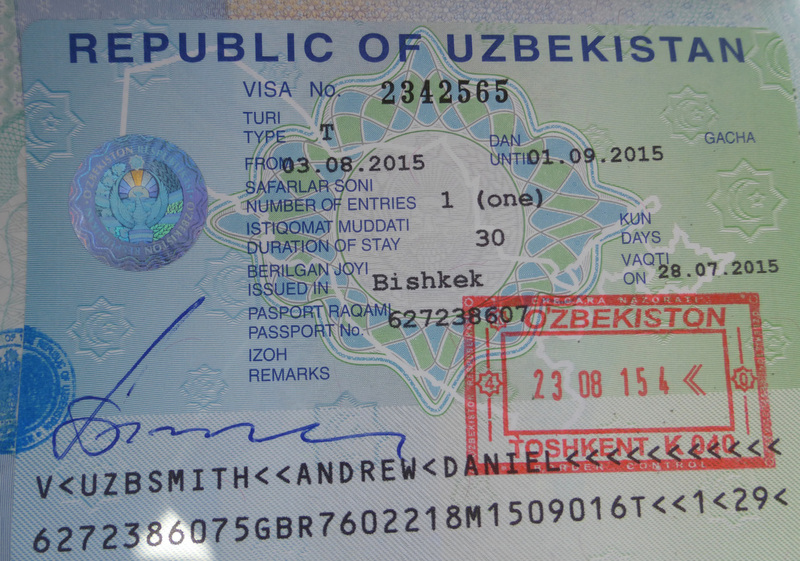 I had my bag scanned, then they stamped my passenger customs declaration forms- they keep one and you keep the other copy which you need to show when exiting Uzbekistan. ​Andy had to take his customs declaration forms to a separate, small office window outside as he is the driver. The stamped his passenger declaration forms- they keep one and you keep the other copy. 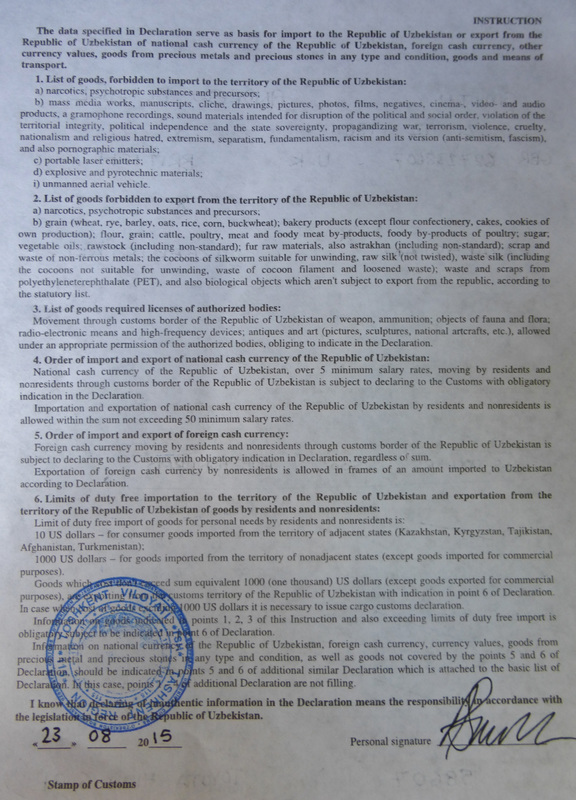 The car details were entered into a computer and a vehicle declaration form printed out, signed and stamped- to be handed in when exiting Uzbekistan. The officer then stamped the small piece of paper and we were directed back to the car. We went back to the car for the customs check- 4 guards searched various parts of the car. They opened the bonnet, wanted the rooftent completely open, looked in the fridge, went through the entire glove box and one of my boxes. An Alsatian drug sniffer dog jumped inside front seats, the other spaniel just came for a cuddle. The search was fairly thorough but fast and friendly, only around 10 minutes. We received the final stamp on our small piece of paper and were directed to the final exit barrier for ‘registration’ where they collected our small paper and entered all our details into another big ledger book.